Platinum. More expensive than gold. Rarer than gold. Bright and shiny. Therefore Kinshachi Platinum Ale must be worth its weight as a premium craft beer. 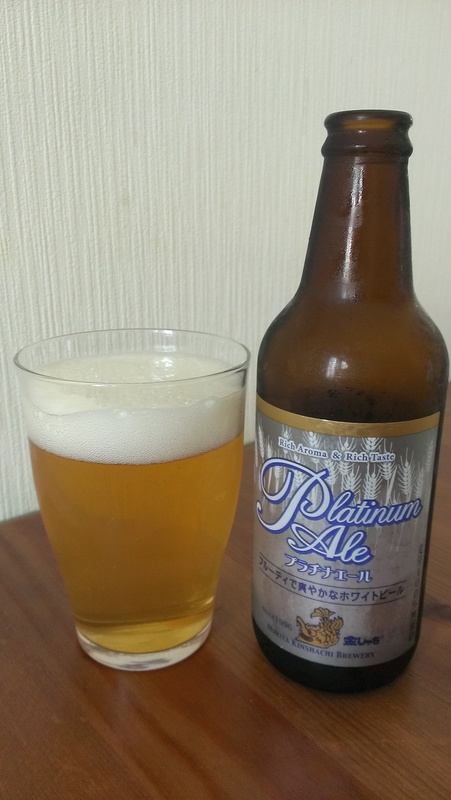 Kinshachi Platinum Ale is another award-winning beer from Morita Kinshachi Brewery having won awards at the Japan Asia Beer Cup in 2010 and 2012, and also the International Beer Competition in 2011. If Morita keeps winning awards for their beers, how comes they aren’t more widely available? Why can’t Duran Duran have sung about platinum and not gold? No funny captions here today. Kinshachi Platinum Ale pours out a platinum blonde (Finally! A joke!) with an off-white head that disappears faster than you can say Kinshachi Platinum Ale. Smells wheaty with a little spice thrown into the mix that will keep you on your toes. A gentle banana smell with a taint of yeast is also present. It’s almost a paint-by-numbers beer. Kinshachi Platinum Ale has a gentle wheatiness to it that is so predictable you can pretty much guess what is coming up next. A citrusy, lemony taste with a wee bit of hops to it that leads to a bitter aftertaste. It’s sticky on the palate and feels like a cat trying to bring up a furball. Kinshachi Platinum Ale is a by the book wheat ale that does what it is supposed to do but perhaps should be called Silver Ale instead. Kinshachi Platinum Ale can be bought online at the Morita Kinshachi online store here, or try Sakaya Okadaya here, or Goodbeer. jp here.